A sailor assigned to a destroyer heading to Spain next year got an early going-away present July 4 from the Virginia Lottery. Gunner’s Mate 1st Class (SW) Christopher Kulp stopped by a Norfolk, Va., supermarket July 4 to pick up some corn on the cob and some shrimp — extra supplies for an Independence Day party. He also grabbed a $5 “Jewel 7’s” scratch-off ticket, which he scratched off in his car. First he uncovered the game portion of the ticket, which showed he was a winner. Then he scratched off the prize — $100,000. His first call went to his wife, who had never been a fan of his lottery-ticket tendencies. 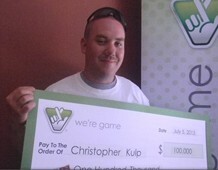 Kulp said his wife didn’t believe him until he brought home the ticket. He couldn’t cash it in because the lottery center was closed for the holiday; he asked his chief if he could leave work a bit early July 5, and he entered the weekend up about $71,000, after taxes. Kulp will move to Rota with his wife and soon-to-be-3-year-old daughter next year as Ross joins three other destroyers that’ll set up shop in Spain by 2015. That’ll help limit his big-ticket purchases, he said, explaining that most of the money will be invested — used to build a college fund and possibly to make a down payment on a house when his duty returns him to the states. The Louisville, Ky., native has gotten some Norfolk-area media attention, but no flood of requests from his shipmates — at least not yet. why in the hell does an active duty service member have to pay taxes on anything? It’s a free country. Nobody should have to pay taxes. Congratulations!!! It’s always so good to know that he’s using the lottery winning as an investment. Very responsible! And maybe he could treat his wife and his daughter out on a vacation just to celebrate.